Visual search is the latest beast tech companies are racing to conquer in 2015. Image recognition and augmented reality platform Blippar demoed the world’s first proprietary mobile visual search capability this week at South By Southwest, while audio search app Shazam is planning to launch visual search mid-year. The relaunched Blippar app (available in April 2015 on iOS and Android), allows users to ‘blip’ objects via their smartphone cameras to activate digital search. Since its launch in the UK in 2011, Blippar has offered augmented reality and 3D experiences on products through users’ phones. Its success in that area has fuelled this move into visual search. Blippar creates “engaging branded experiences that are triggered by objects, magazine pages, advertisements and more”, says its CEO Ambarish Mitra. The company has so far partnered with brands including Nestlé, Condé Nast, TIME Inc., Procter & Gamble, Kraft, Heinz, PepsiCo, Coca-Cola, Anheuser Busch and Jaguar. Their content has been “blipped” by millions of users around the world, Mitra says. The app will begin in visual search by “making all English-language album covers, fiction books, DVD covers and movie posters blippable”. Users who blip these items will see contextual, snackable information within the app. 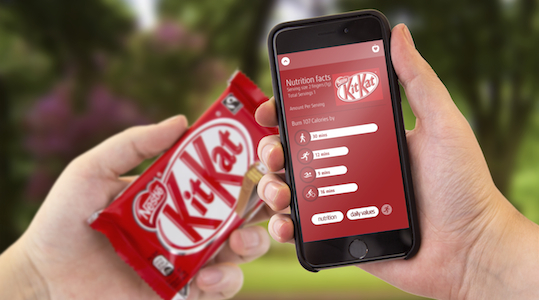 “In the future, Blippar will add to its growing catalogue of blippable objects in stages, with the ultimate aim of making everything blippable – from an apple, to a chocolate bar, to a dog on the street, to the Eiffel Tower and beyond,” the company says. Shazam regional sales director Steve Sos told Marketing recently that the audio search app is planning to expand into visual search mid-year. The brand is partnering with Digimarc to take advantage of its print-to-digital technology, expanding on Shazam’s mission for ‘making traditional media clickable’ by providing gateways to content. “That’s probably mid-year, probably June is what we’re aiming for,” Sos said. Although the company is staying true to its music heritage, Shazam is focusing on branching out to expand its relevance, which includes this new foray into visual search as well as into beacon technology. Shazam currently offers its popular audio recognition technology to brands, inviting audiences to open the app to ‘Shazam’ to see digital content curated through the app.